I always love reviewing retinal photos with patients, because so much can be going on inside the eye without ever causing any vision issues! Here is one such example: that circular deformity at the optic nerve in this photo is a congenital condition called an optic nerve pit. When the eye is developing in the womb, a structure called the optic vesicle (the precursor to the optic nerve) turns in upon itself to create a channel through the center of the nerve fiber where all of the blood vessels to the eye will eventually pass through. 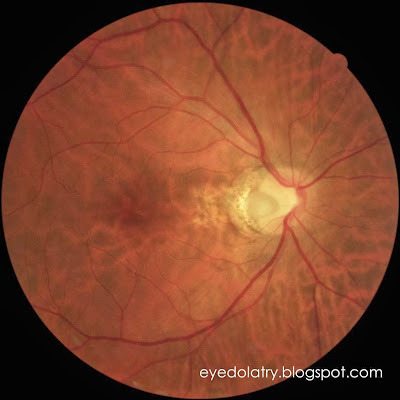 This grove or hole is the "cup" we often speak of when determining glaucoma risk. If the optic vesicle doesn't close completely after this fissure or groove is created, an optic pit is formed. Basically this is a little hole or excavation in the nerve where the tissue didn't close up properly during development. In and of itself, it is typically asymptomatic and will only be found by a doctor examining the child after birth. Most of the time, an optic pit is harmless -- you may have an enlarged natural blind spot in your field of vision, but most people are not bothered by this (optic pits are usually only in 1 eye). There is an association with serous retinal detachment, however. Since the optic pit it is usually located near the macula (central vision area), a detachment in that area can be devastating to vision. Therefore, a person with an optic pit is watched closely for signs of swelling or fluid leakage inside the eye. If this occurs, laser treatment can minimize the damage if caught early enough and prevent permanent severe vision loss. Without someone looking, you would never know if you have an optic nerve pit, so make sure you are seen by an eye doctor for routine health care even if you have no vision complaints!